Received exciting news at the beginning of March that I'd been shortlisted for the Woolgather Art Prize 2012. 25 artists have been selected and the show will open on friday 11th May in a venue yet to be decided in Leeds. In the run up to the prize each artist was asked to make a short film about their dream for the future: here is mine. Participants of the Sites in Sight Residency, Mary and Clare came over to The Art House the day before our event and cooked up a storm. Their amazing bakes are on show here and were appreciated by all. We turned a room in The Art House into a mini residency space, asking visitors to swap friendship and food memories in return for a slice of cake. We welcomed a diverse audience on the Wakefield Artwalk and were able to share our project with many new faces. 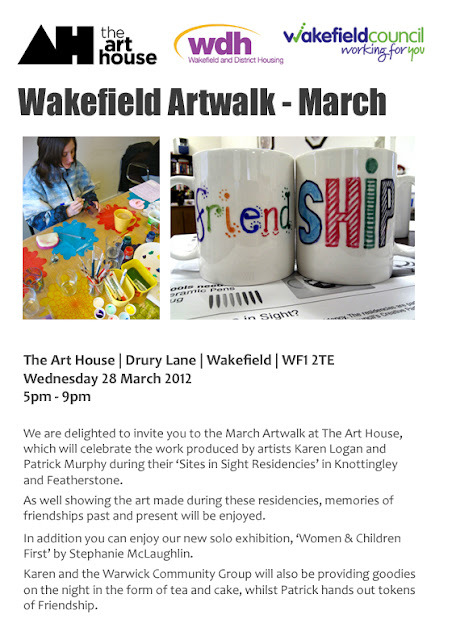 All welcome to The Art House for a taste of my residency.